The current discourse on mine closure is informed predominantly by industry and corporate perspectives and predicated by experiences of mainly mining companies that are based in developed countries where necessary planning frameworks and regulatory requirements are well-established. Mine closure planning, well promoted and accepted as good business practice in the global minerals industry, has been primarily technical and precautionary both in approach and focus. Planning, modelling and monitoring strategies incorporate comprehensive and detailed elements such as properties inherent in landforms, climate, geology, flora and fauna, among others. However, locality-based concerns that revolve around resource access and tenure, rights and entitlements tied to locality and indigeneity, labour recruitment, and other non-bio-physical elements are hardly examined. Any mine closure program that omits these elements is deficient and therefore ineffective. 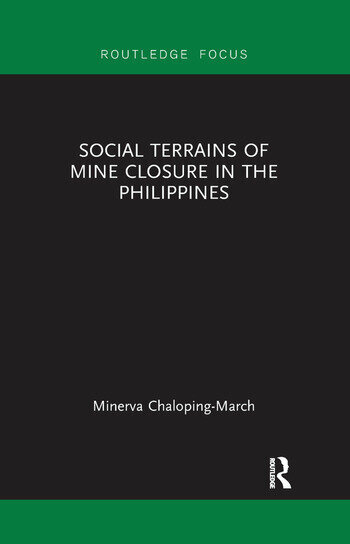 Social Terrains of Mine Closure in the Philippines, based on ethnographic research and archival materials, presents the varying experiences of three mines to demonstrate that the mine closure process is an intense locus for competition and compromises among various social actors. This book offers key messages for understanding the complex socio-cultural, economic, political, and business realities that make up the social terrains of mine closure, and will be of great interest to students and researchers in development studies, community development, business studies, anthropology, and sociology. It will also appeal to those working in the global minerals sectors and NGOs that engage in development work and advocacy for responsible mining. Minerva Chaloping-March, who grew up in a mining district in northern Philippines, combines consulting and research on social dimensions of mining, cultural criteria for mine closure, and transitions of mining communities. She is currently an Honorary Research Fellow at the Philippines - Australia Studies Centre, La Trobe University, Melbourne, Australia.